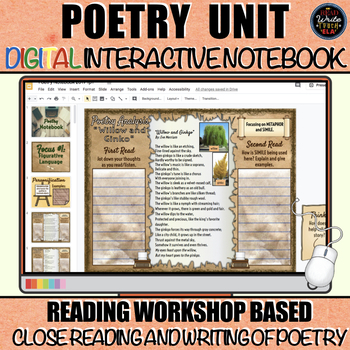 This DIGITAL Poetry unit is packed with 14 editable poems/songs for students to read, interpret, and analyze. It is structured around a Reading/Writing workshop model. 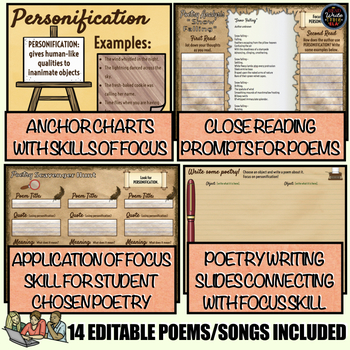 Each day/session begins with an anchor chart focusing on figurative language or poetry elements. Then, a poem/song is shared together as a class to read and analyze using close reading strategies. Next, they have another poem to interpret with partners. Lastly, each day/session ends with the opportunity to use the skill in poetry books chosen by students. This was on of my favorite units to teach my 6th graders and it's also great for test prep! Plus, this is a good **2-3 weeks worth** of material!